Old Man Winter has a firm grip in the Great Lakes, especially along the west coast of Lake Michigan. Nearly breaking records for ice coverage this year, at the peak we had an average of 24” to 30” of ice in our protected harbor and marina areas in Southeast Wisconsin. Every winter is different in the Midwest. Some years we get great ice fishing conditions while others we aren’t so lucky. This year the ice has been excellent. Winter has yielded good ice fishing opportunities in the harbors of Southeast Wisconsin. We’ve had good ice since early December and have been able to fish in a lot of areas that we normally don’t get to fish this late in spring. In fact, we may have ice heading into April. In previous years we’ve had ice lock us out where you can’t fish out of a boat because of too much ice, but there’s not enough good ice to ice-fish safely. Some years you get that in-between scenario. Two years ago, for example, Milwaukee Harbor was open, yet areas like Racine and McKinley were locked up with ice that was unsafe to fish. If winter like weather holds, we should have three or more weeks of ice fishing. 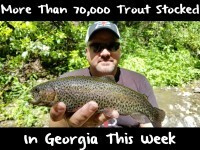 This will make for great brown trout and steelhead fishing. 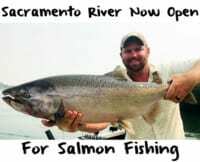 With recent rain events and one to two day warm ups, many of our tributaries have opened up for anglers chasing chrome with long rods. Drifting cured and fresh spawn under floats is lethal as soon as anglers can safely wade and access rivers. In the Southeast part of the state, Racine (Reef Point Marina), Kenosha (Simmons Island) and Milwaukee (McKinley Marina) have more than safe ice right now. The biggest factor when determining safety is watching the warmer weather along with longer days of sunshine softening the shoreline ice. The shoreline ice is what goes first. As long as the shoreline is safe and solid you’ll be able to get out. Always take safety into consideration and go with a buddy. Recently we had a few days near 50 degrees with at least 5-6” of ice diminishing off the top. Even with days in the 20’s I am seeing melt. With the angle and height of the sun it’s more intense as we move later into spring. This will be more a factor to keep close tabs on. While browns and steelhead are available in the above-mentioned areas, usually steelhead will be more prevalent moving into March and April, particularly in areas with water flow such as river inlets, outflows, aerators, bubblers, between slips and around docks. One thing to keep in mind, these areas are productive, but can also be the most dangerous as ice deteriorates quickly around them. I’ll target these species with an array of baits: hard baits such as hair jigs, spoons, swimming baits or soft baits such as swim baits, tubes and soft plastics. Another huge part of my arsenal is rigging cured eggs implementing Pautzke BorX O Fire, Fire Brine and Fire Cure on my brown trout and steelhead eggs. Tweaking my eggs with Fire Power (krill powder) also adds that extra punch, especially later in spring when the clarity of the water diminishes. I also rig natural spawn and minnows on my Automatic Fisherman rigs mixing up baits increasing chances for hook ups. Running my guide trips on the Great Lakes, I use Automatic Fisherman units increasing hook-ups on the ice. Trout are notorious for running and dropping the bait. The Automatic Fisherman setup takes this out of the equation quickly setting the hook on the fish allowing the fish to play against tension of an accurately set drag until the angler gets to the rod. I try to remain stealthy spooling up with 6-pound Berkley Vanish for my mainline, a 4-pound fluorocarbon leader, tying on size 6-12 Eagle Claw Octopus Circle hook when fishing spawn sacs. On guide trips we use a heavy amount of spawn sacs, but size varies. The fish certainly have a preference day to day. One day fish may want a sac the size of your index finger; other days they want the size of your thumbnail. I use sacs tied in pink, orange and chartreuse netting for the steelhead, but if the water is ultra-clear, I’ll go with natural netting material, presenting the natural color of the eggs. Recently, Browns have been favoring minnows; more steelhead have been caught on eggs. Placing the bait is important; most of the time my baits are within the bottom three feet of the water column. In fact, jigging with a Vexilar flasher unit can help you place your baits accurately telling you if the fish are on the bottom or suspended. Placing your bait accordingly. Most of the time the fish will be in the bottom five feet. Most important, locate the baitfish and you’ll find the browns and steelhead. Mix up your spread, some days we run some of our baits a few inches off the bottom to half way up the water column. Mornings tend to be the best for success especially in our urban environment. It is not uncommon to have 30-40 anglers in a small area by sun up. This equates to near 100 lines in the water if not more. We are allowed three lines per angler in Wisconsin. Taking advantage and maximizing our catching potential, I will drill double the holes for the amount of guys on the ice. So if there are six of us I’ll drill about 30 holes. We are allowed 18 holes, but I’ll have a few more open so the guys can try other holes if some aren’t productive. Many days staying mobile is key. Jigging has its advantages in locating fish. If rigs are not getting bit in a half hour, move them if possible. Being on your game is vital to success catching trout, stepping up the game to what seems to be tenfold catching urban pressured fish. Timing for the best bite in the morning is sun up until about 11 a.m. It slows midday, but the afternoon can be equally as productive. Editor’s Note: John Reddy operates Reddy Guide Service. 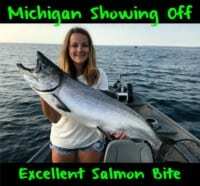 For more information on his guided Southeast Wisconsin ice fishing trips please visit http://www.reddyguideservice.com/.